It's a First! American Girl Unveils Two Historical Characters Sharing One Unforgettable Journey Through New Orleans in 1853 | Mattel Inc.
Company Partners with 13-Year-Old Kate Connick and Her Father, Harry Connick, Jr., to Debut Original Song, "A Lot Like Me"
MIDDLETON, Wis.--(BUSINESS WIRE)-- For the first time in American Girl's 25-year history, the company is introducing two different historical characters, Cécile Rey™ and Marie-Grace Gardner™, in one six-book series set in 1850s New Orleans. The new characters—one African American and one Caucasian—show the power of friendship and community as they reach across the boundaries of race and class to help their families, friends, and city during a time of great need. To celebrate Cécile and Marie-Grace's debut and the rich musical tradition of New Orleans, American Girl has partnered with 13-year-old Kate Connick and her father, world-renowned musician and actor Harry Connick, Jr., to create an original song—"A Lot Like Me"—with all proceeds benefiting the Ellis Marsalis Center for Music in New Orleans. 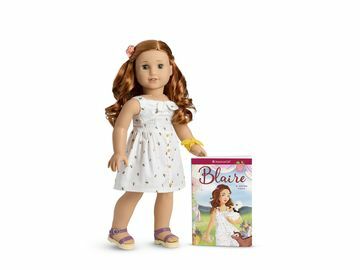 "We're proud to introduce Cécile and Marie-Grace to our historical line and excited to be partnering with Kate and Harry Connick, Jr.," says Ellen L. Brothers, president of American Girl. "We know our fans will embrace the New Orleans characters and Kate's song, as they express the values of friendship, bridging differences, and working together to help others." Taking inspiration from the Cécile and Marie-Grace stories, "A Lot Like Me"—performed by Kate and written and accompanied by her father—shows girls the importance of looking within to find the true meaning of friendship. Available exclusively on iTunes in August, all proceeds from song downloads will benefit after-school programming at the newly founded Ellis Marsalis Center for Music in New Orleans. Located in the heart of Musicians' Village in the Upper Ninth Ward, the center provides classrooms, rehearsal space, a recording studio, and a state-of-the-art performance hall. Most importantly, the center ensures that the New Orleans sound will live on and local children will continue to learn from music legends.
" ‘A Lot Like Me' is a really fun song with such a good message—just like the books about Cécile and Marie-Grace. It's about knowing that it doesn't matter what skin color you have or what religion you follow—what's inside is what's important," said Kate Connick. "I have friends who have different backgrounds. They come from different places, so this means something to me. I'm just so happy that I get to be a part of it." Despite different backgrounds and life stories, Cécile (a bold, confident girl from a well-to-do African American family), and shy, caring Marie-Grace (who has just moved back to New Orleans with her father), form a unique bond through their shared love of music. Later, their growing friendship deepens as they work together to help their community during the yellow fever epidemic that sweeps through New Orleans in 1853. 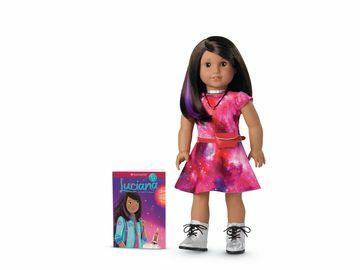 Each character is brought to life through a beautifully designed 18-inch doll, plus an array of historically accurate and culturally authentic clothes and accessories that reflect the girls' heritage and time period. Cécile's stories are authored by Denise Lewis Patrick, and Marie-Grace's books are written by Sarah Masters Buckey. The stories—starting with Meet Marie-Grace and Meet Cécile—weave together in one six-book fiction series, offering readers alternating perspectives of both characters' experiences. The Cécile and Marie-Grace dolls, books, and accessories will be available to pre-order on August 8, 2011 at americangirl.com, at all American Girl retail locations, or by calling 1-800-845-0005. The new line officially launches in all American Girl outlets on August 30, 2011. The Ellis Marsalis Center for Music, a 17,000-square-foot facility newly constructed in the Upper Ninth Ward in New Orleans, will be the centerpiece of the Musicians' Village. Slated to open August 25, 2011, the Center will serve as a performance, education, and community venue that will include a 150-seat performance hall, recording studios, teaching facilities for individual and group instruction, and a gathering place for the community. For after-school programming, the center will partner with neighborhood schools to provide music and dance lessons in a safe environment for children in the Upper Ninth Ward, many of whom lost everything in the devastation of Hurricane Katrina.